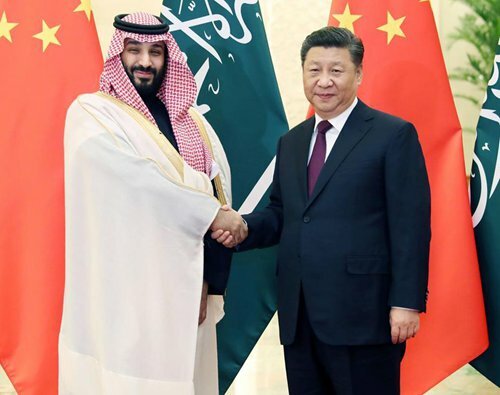 China signed a series of cooperative agreements with Saudi Arabia in politics, shipping, energy and a number of other sectors, as Saudi Arabia Crown Prince Mohammed bin Salman Al Saud's China visit ended on Friday. Chinese President Xi Jinping on Friday met with Mohammed at the Great Hall of the People in Beijing. Vice Premier Han Zheng attended the meeting. Xi said that the two countries should accelerate the signing of the Belt and Road Initiative (BRI) and Saudi Vision 2030 coordination plan and promote cooperation in energy, infrastructure, trade and investment, and high value-added industries to achieve new results. Xi also said that the two countries should jointly promote the construction of the China-Gulf Cooperation Council free trade zone. The two sides should also promote counter-terrorism cooperation in the Middle East, strengthen international cooperation in de-extremization and prevent the spread of extreme thought, Xi said. Mohammed said Saudi Arabia is willing to work with China to deepen cooperation in jointly developing the Belt and Road. Han on Friday co-chaired a meeting of a high-level steering committee with Mohammed, and said China-Saudi Arabia had maintained close communication and coordination since the second meeting of the committee. The China-Saudi Arabia High-level Joint Committee was set up in 2016, the Xinhua News Agency reported. Han and Mohammed witnessed the signing of a series of cooperative agreements covering politics, shipping, energy and finance. Sultan Mofti, deputy governor for investment attraction and development at the Saudi Arabian General Investment Authority, told the Global Times on Friday that more than ever now is the time to tap the Saudi market, noting that the Saudi government has greatly improved efficiency to better serve foreign companies. "In 2018, 19 Chinese manufacturing companies obtained licenses in Saudi Arabia, 86 licenses were in construction, six in information technologies, eight in services," Mofti said. "We want to see more Chinese companies in all sectors," Mofti said. Jefferson Wang Yu, a global partner at the consultancy firm AT Kearney, said that the previously tight strategic relationship between Saudi Arabia and the US made the country take a conservative approach on investment from China. The country did not reap as many earlier harvest projects from the BRI as neighboring countries did. "However, Saudi Arabia has now adopted more diversified and open policies," Wang told the Global Times. "As Chinese BRI investment bid farewell to its early stage, with new initiatives on focusing on the green and digital economies, they are actually more aligned with Saudi Arabia's post-petroleum development demands especially in high-tech solutions such as smart cities, 5G, AI, hi-tech parks and new energy," Wang said.